It is rare to find Poodle puppies coming into rescue organizations or animal shelters, so most likely if you have your heart set on a puppy, you will be purchasing a dog from a breeder. A link at the bottom of this post contains a list of Poodle breeders for your reference. We do not know these breeders personally, so it is very important to ask the right questions when you make contact with the breeder. An ethical breeder will have a lot of questions for you as well, because they want their dogs placed only into homes with purchasers that are well-matched for them. If you are considering becoming a breeder, please make that the breeder breeds only dogs that have had all genetic health clearances recommended for that variety of Poodles (Toy, Miniature of Standard) by the Poodle Club of America. Also, ask for a written contract and make sure you understand exactly what the breeder will offer you if your dog does develop a hereditary health issue. Will they offer you a replacement puppy at no charge or at a reduced price? If yes, will you be allowed to keep the original dog or would they expect it to be returned to them? No one wants to return a beloved canine companion to the breeder a year after they have purchased it, so make sure if a replacement is offered, that you will still have the option of keeping your original pet. Of course all companion Poodles should be spayed or neutered, so the contract you sign with the breeder will also be likely to specify a date by which you should have this done. When purchasing a Poodle puppy as a companion, make sure that good health and good temperament are your priorities. All Poodles are pretty, so don't choose your puppy based on the colors a breeder might have, choose based on the soundness of that breeder's breeding stock. It is human nature to be drawn to certain colors of dogs, so I am not saying give up the desire of your heart, just don’t agree to buying a certain pup too quickly simply because of color. Wait until you can have an apricot colored puppy who comes from an ethical breeder. Health screening tests have been developed to help Poodle breeders screen for certain problems in hopes of eradicating genetic diseases. Addison's Disease, Atrial Septal Defect (ASD), Gastric Torsion (Bloat), Cushings Disease, Epilepsy, Hip Dysplasia, Hypothyroidism, Legg-Calve-Perthes, Neonatal Encephalopathy, Patellar Luxation, PRA, Optic Nerve Hypoplasia, Juvenile Cataracts, Sebaceous Adentis (SA) and Von Willebrand's Disease (vWD). But in regards to ethics, a breeder does NOT have to be a member of PCA or MCPCA to be ethical! Some people simply don’t enjoy being members of organizations, plus, all dog people (people who have been “in dogs” for a number of years) can tell you stories about people who were even board members of national breed clubs, who in their dealings with unethical. This article is primarily to give you an idea about health problems, so you can ask the right questions when you call a breeder. Expect that they will ask you a good many questions as well, because ethical breeders want to make sure their dogs go to good homes. Last but certainly not least, ask how the puppies are being kept. Ethical breeders may have any number of set-ups, from an exercise-pen with potty pads down in the bedroom or kitchen, to indoor/outdoor runs in a fancy kennel building, to a stall in a stable. Sadly, so can unethical breeders and puppy millers! Ask how many dogs they keep, and if they keep more than a dozen or so, ask if they have kennel help. Ask if you can come visit, even if you live so far away that you know you will need to buy a puppy and have it shipped to you---because if the breeder never allows anyone to visit, they may have something to hide. Most of the tips are simple common sense. But…Poodles and Poodles mixes are both so endearing, especially as fluffy puppies, that sometimes we allow our heart to rule instead of our head!! So before you take that leap, read back over this article and sit on things a day or two. If you are a praying person, pray about it. If not, at least think about it in your quiet moments. Best wishes for a long and happy life with your new pup! Thank you, Rick Miles, for use of photograph, and to Melanie Schlaginhaufen, who wrote the original version of this article. Jumping up is one of the most common problems people have with their dogs. 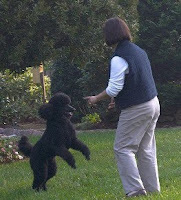 Dog trainers see this misbehavior in all dogs, even the Poodle! It is actually rooted in social behavior, in the way our dogs relate to people. The start of the problem goes all the way back to our habit of carrying puppies around, instead of putting them on leash as soon as possible and making them keep all four feet on the floor. Hence they get used to the feeling of being up close to our face, and still long for that type of contact even when they are older. Jumping on favorite people is very common in all types of dogs. Jumping up to greet visitors is more common in highly social breeds, such as retrievers. A more aloof type of dog, such as an Akita or a Chow, is usually not tempted to jump up on strangers. 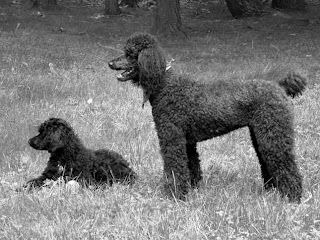 Standard Poodles...not really dogs, but people in a curly body? I confess. I love Standard Poodles. I mean I really, really adore them. When people ask me what type of dog might be best for their family, I almost always start with mentioning Standard Poodles. 9 times out of 10, they confess that they are "not Poodle people". That's okay. Crazy, totally unbelievable, but okay. And why do I think it is crazy not to love Standard Poodles? Because they can be anything you want in a dog. Get them groomed by the best groomer in town and they will look like an elegant aristocrat. Buzz them down and they are happy to masquerade as a "real dog". 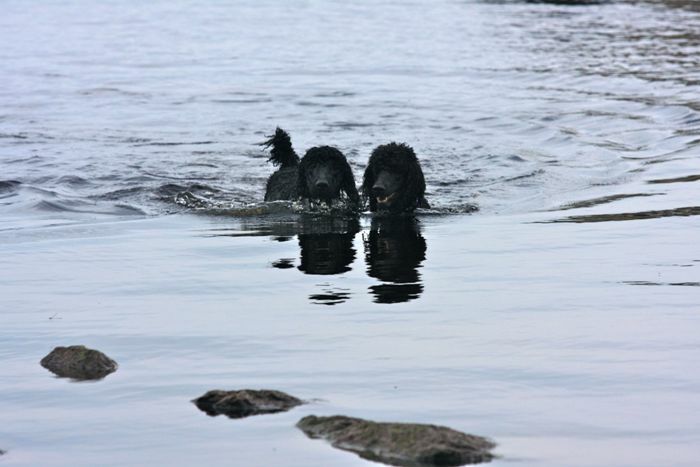 A Standard Poodle from working lines can even impress you with what the breed was originally bred to do--be a water retriever. 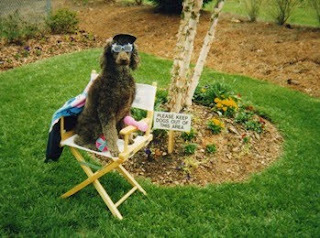 A Standard Poodle is capable of learning all types of tricks to entertain your friends, as he is a true "clown at heart". Excellent therapy dogs, they love to bring happiness to nursing home residents, or help you educate special needs children. Standard Poodles are pure gold in the agility, rally or obedience ring, and tons of fun for those interested in dog sports. It sounds a bit silly, but the truth is...Poodles are really, truly FUN. I’m talking about all Poodles--big curly dogs, energetic water dogs, little lap dogs, flying leap agility dogs, groomed-up-to-look-ridiculous show dogs and just plain simple Poodle dogs. If it is Poodle-ly, it is, in my book, fascinating. I’ve been known to drive around in my husband’s construction truck with a Standard Poodle in show coat who has their hair up in colored papers and rubber bands. Why? Just to irritate non-Poodle folk I guess. 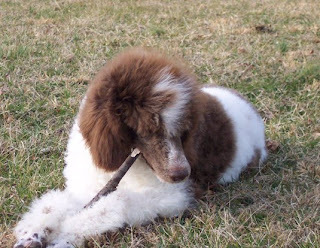 Although I have trained and shown other dogs for many years, I don’t have any Poodles in show coat anymore, in fact, never even had a Poodle “show dog” turn out to be of show and breeding quality, so they have all retired to be beloved housedogs and training demo dogs. My first Standard Poodle became an excellent therapy dog at nursing homes, but another Poodle that came to me at a late age after his owner passed away never did anything more exciting than play a little tennis ball with us and make the neighbors smile at his clownish ways when we took him on walks. But each one of them, each curly dog that has ever ventured into my life, has been worth their weight in gold. I hope never to be without at least one Poodle dog. There is just something about these creatures, these people in curly dog suits. 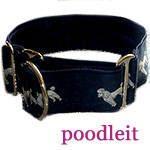 If you feel the same, this blog is dedicated to you….to Poodle lovers everywhere. Enjoy!